FIRST off, let’s get one thing straight: It’s Ceed, not cee’d anymore. 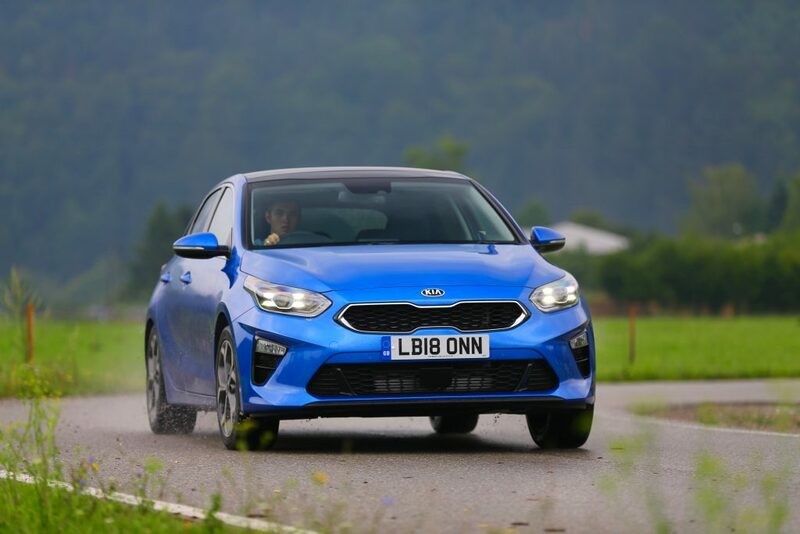 Okay, the pronunciation is exactly the same but Kia have, quite rightly, decided that the original name could be a little confusing so they’ve dropped the apostrophe and capitalised. 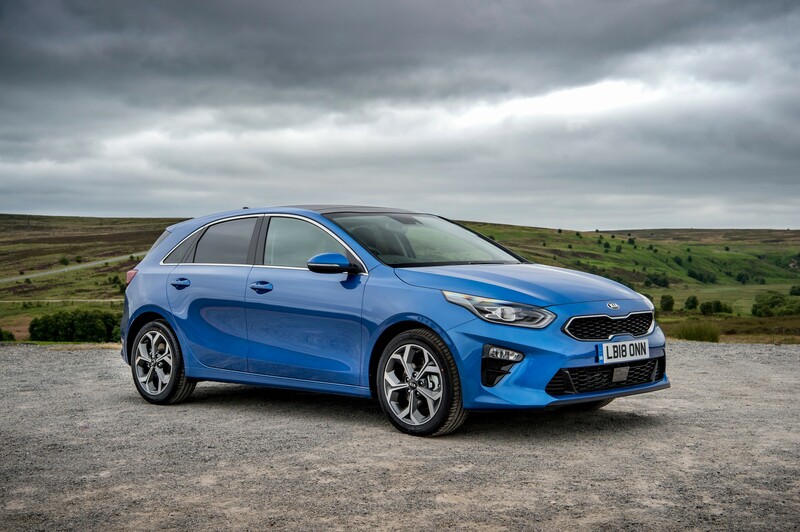 And with a “snappier” name comes a snappier look – the new Ceed really has raised the bar for Kia’s mid-sized family hatch and although it looks great in photos, I found it looked so much better in the flesh. Lower, wider, and with a longer rear overhang than the car it replaces, the Ceed’s silhouette certainly looks sportier. Straight lines replace the rounded-off edges of its predecessor, with a wider ‘tiger-nose’ grille and lower air intake. At the rear, new LED daytime running lights give the Ceed greater visibility on the road. Paired with straight lines in the bodywork and a subtle rear boot spoiler, the Ceed presents a more “planted” and slightly more aggressive appearance which compares favourably with rivals such as the Volkswagen Golf, Skoda Octavia and Peugeot 308. It even gives the new Ford Focus a run for its money. The new Ceed is available in 11 versions, based on four trim levels – ‘2’, ‘Blue Edition’, ‘3’ and ‘First Edition’. All models are front-wheel-drive and feature a five-door hatchback body-style with prices ranging from £18,295 up to £26,850. 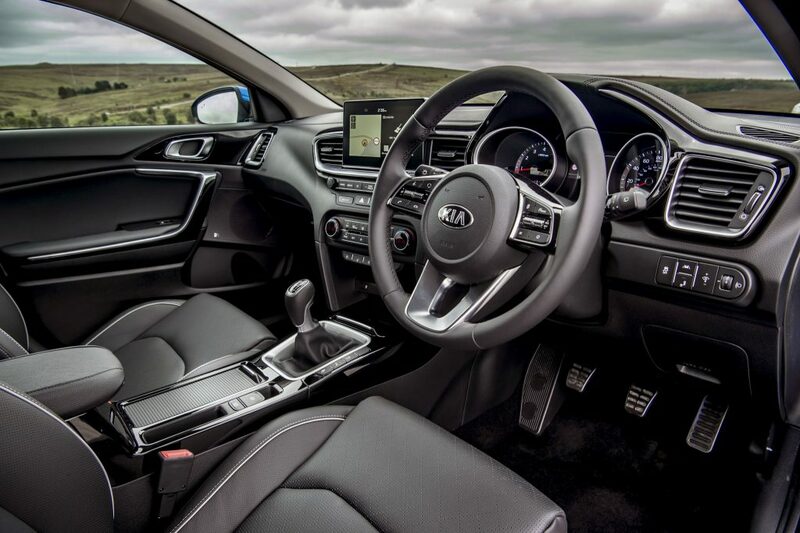 The range has a wide choice of powertrains with petrol options including an updated version of Kia’s popular 1.0-litre T-GDi engine, producing 118bhp, as well as an all-new 1.4-litre T-GDi power unit which replaces the earlier 1.6-litre GDi engine. 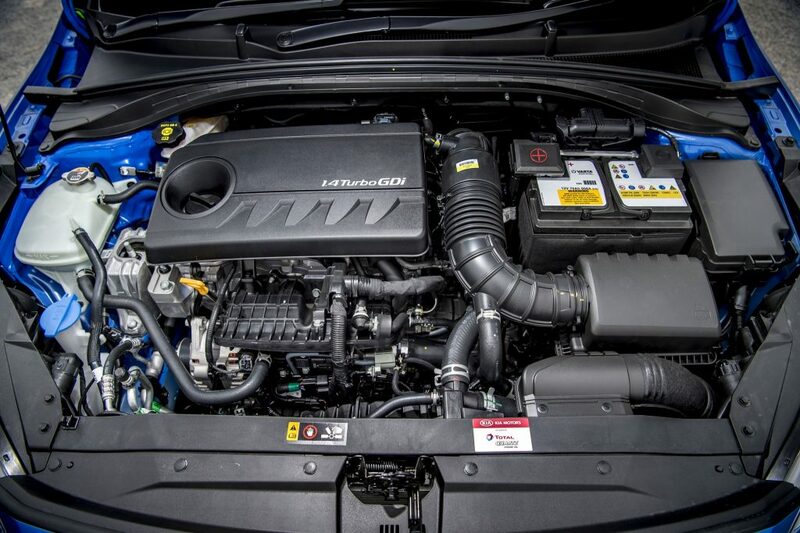 The 1.4-litre T-GDi engine produces 138bhp with the engine’s turbocharger giving a wider torque band than the earlier 1.6-litre engine making it more responsive while also reducing emissions. The Ceed is also available with Kia’s all-new 1.6 diesel engine. The engine produces 114bhp and 280Nm of torque when paired with a manual gearbox or 300Nm of torque when fitted with Dual-Clutch Transmission (DCT). 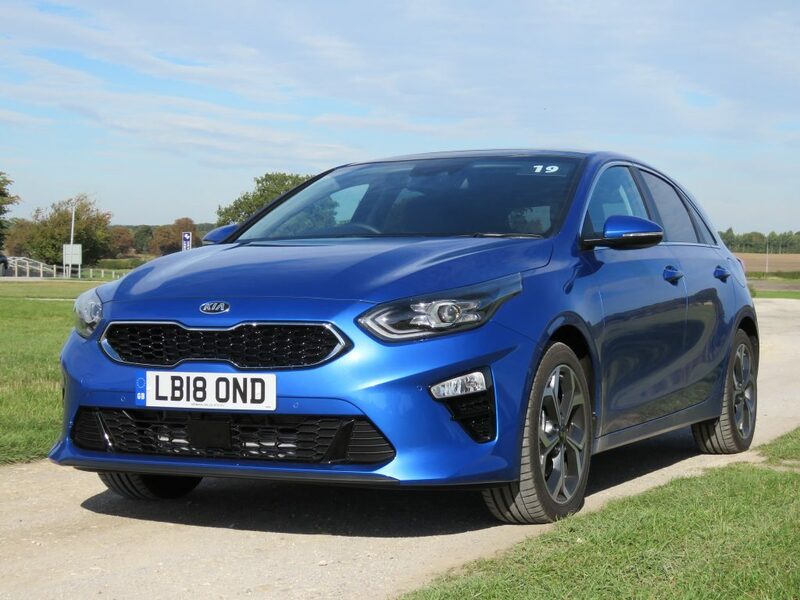 I’ve been driving the £25,750 Kia Ceed 1.4 T-GDi First Edition model fitted with a manual gearbox and I must say that not only does it look fabulous from the kerbside (especially in Blue Flame) but the interior is even more impressive. The Ceed feels more ergonomic than ever and contains better quality materials than used before. Okay, it’s not up to VW Golf standard but it isn’t far off and it feels more upmarket than the Ford Focus or the Vauxhall Astra. The perforated full-leather seats in my car looked and felt very classy. They’re comfortable too and with 10-way electronic adjustment you’ll easily find the perfect driving position. 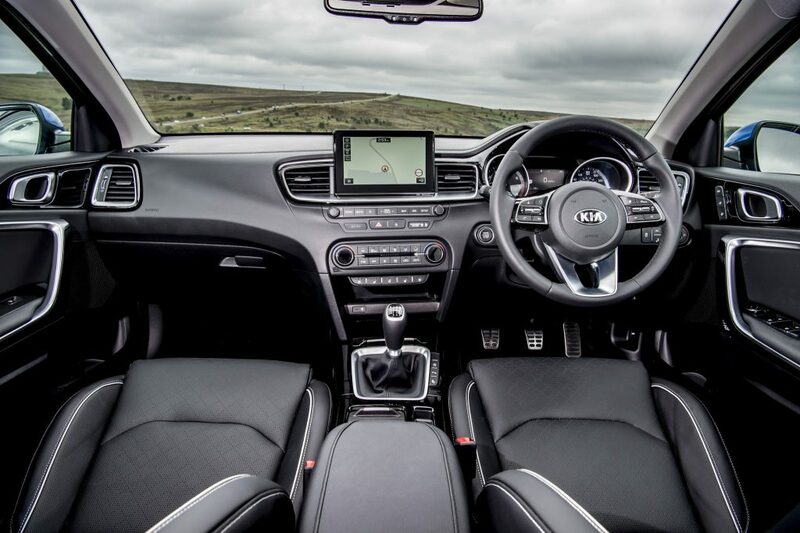 The cabin layout from the most recent Kia vehicles has been adapted for the Ceed with the dashboard laid out horizontally for a more slimline appearance and split into an upper area – for the ‘floating’ touchscreen infotainment system – and lower level, housing controls for audio and heating and ventilation, which means you don’t have to navigate through various screens simply to change temperature or volume. Visibility is good looking forward but only so-so through the narrow rear window – but fear not as every Ceed comes with a reversing camera as well as electrically adjusted and heated wing mirrors. Step up to the ‘3’ model and you also get rear parking sensors. All but the base model get an 8in touchscreen with Sat Nav and Apple CarPlay along with Android Auto. 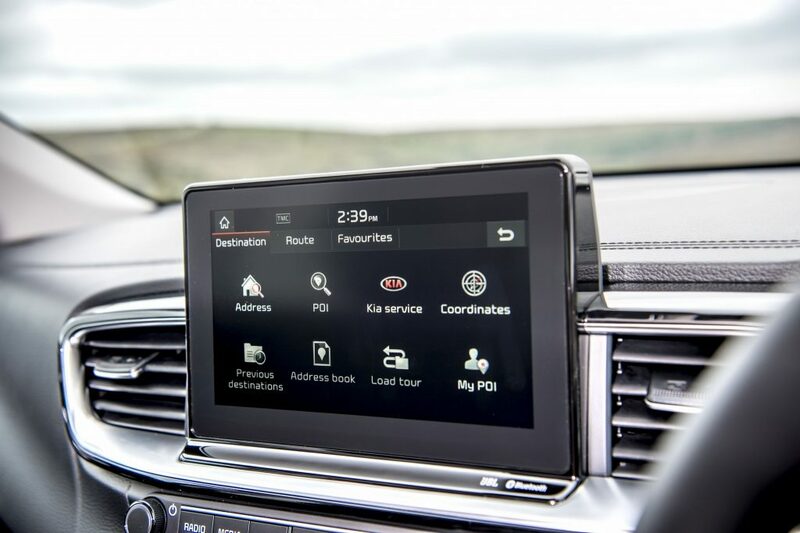 Base models get a 7in screen and no Sat Nav – but they do get Apple CarPlay and Android Auto so you could always use your smartphone to get around. The screen is responsive and clear with most functions being intuitive and while there are slicker units available from the competition, I don’t think you’ll find much to complain about. 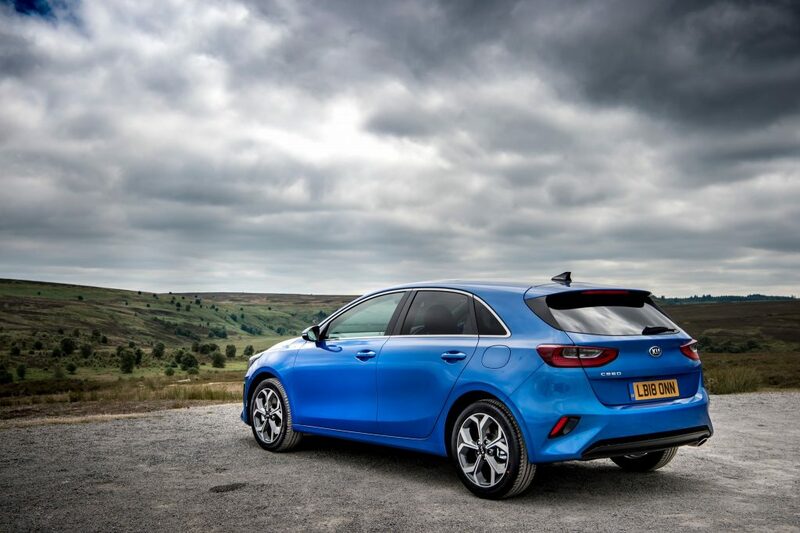 Likewise, rear passengers won’t have much to complain about either as the Kia Ceed is comfortable enough to carry 2 adults in comfort and 3 at a pinch. My only criticism would be that the standard-fit sunroof on the First Edition model eats into the headroom by a couple of inches so taller rear-passengers may struggle. At least the rear doors open nice and wide so entering and exiting shouldn’t be a problem and neither should lifting out babies and toddlers. 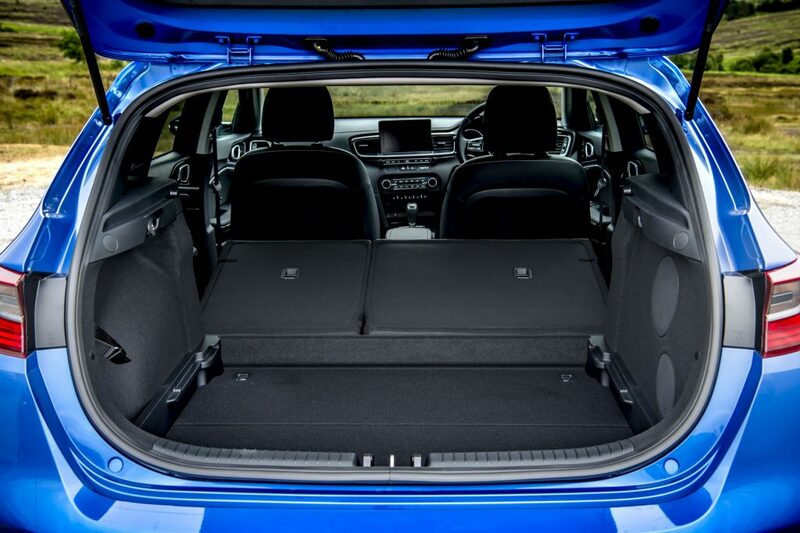 Boot space is slightly better than the Golf and Focus at 395 litres and the boot floor is usefully adjustable too, giving you more depth if needed. 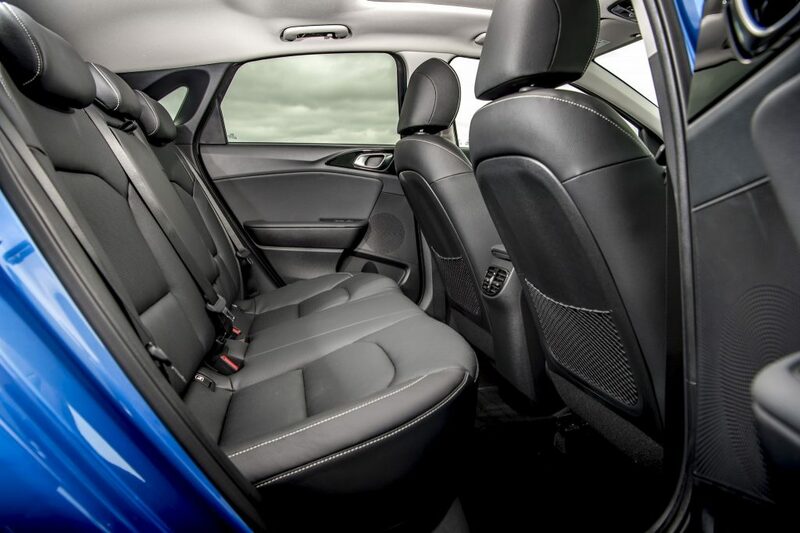 The 60/40 split rear seats also fold nice and flat giving you a whopping 1,291 litres, if needed. On-board tech is plentiful too with even the base ‘2’ model getting many features that are usually a cost option on rivals, including cruise control with speed limiter, air conditioning, electric windows all-round and automatic headlight control. 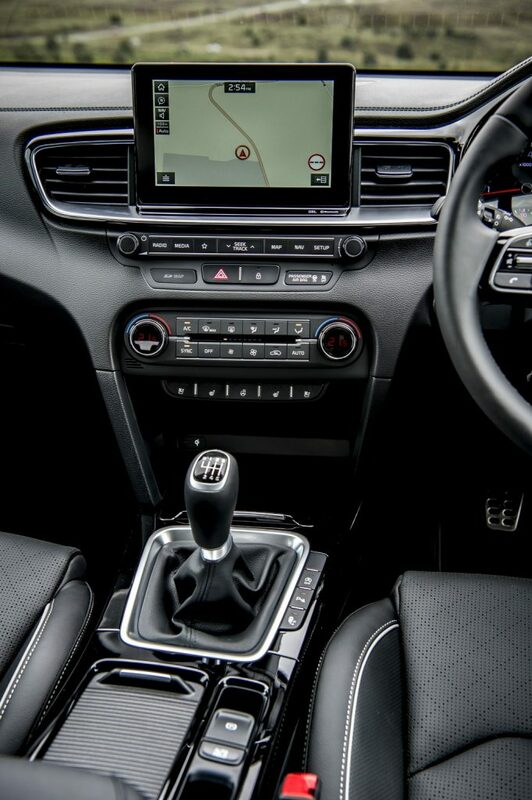 Moving inside, base models also get a leather-trimmed steering wheel, gearshift and handbrake while you’ll also benefit from a DAB radio, Bluetooth with voice recognition and music streaming. Safety systems are impressive with Lane Keeping Assist, High Beam Assist, Driver Attention Warning, Hill Start Assist Control and Forward Collision-Avoidance Assist – all included as standard. My ‘First Edition’ model was brimming with technology, including a Smart Park Assist System which integrates front and rear parking sensors with the ability to automatically park in parallel or perpendicular spaces, while smart cruise control with stop and go functionality and a Drive Mode Selector are featured when the seven-speed Dual-Clutch Transmission is chosen. Inside there are heated and ventilated front seats, heated outer rear seats and a wide electric tilt and slide sunroof with automatic roll blind. There is also a heated steering wheel, stainless steel pedals, smart entry system with engine start/stop button and an eight-speaker JBL premium sound system with wireless mobile phone charger. Extra safety systems include Blind Spot Collision Warning, Speed Limit Information Function and Forward Collision-Avoidance Assist with Pedestrian Detection. Lane Following Assist is also available on DCT models. But how does the new Kia Ceed drive? Well, the 1.4 T-GDi provides more than enough power and flexibility to make the Ceed a pleasant drive around town and a very able motorway cruiser. The gearshift is slick enough while the steering is a little numb but no worse than rivals and perfectly acceptable in that respect. You will find the ride pliant over the worst roads and speed-humps and although both the VW Golf and Ford Focus do a better job of insulating you from the worst jolts the Ceed certainly won’t disappoint. Take the Ceed for a blast along A or B-roads and you may be pleasantly surprised by how the car responds with well-controlled body-roll and steering that is quick (just 2.44 turns from lock-to-lock), with just a hint of understeer if you get a little silly. 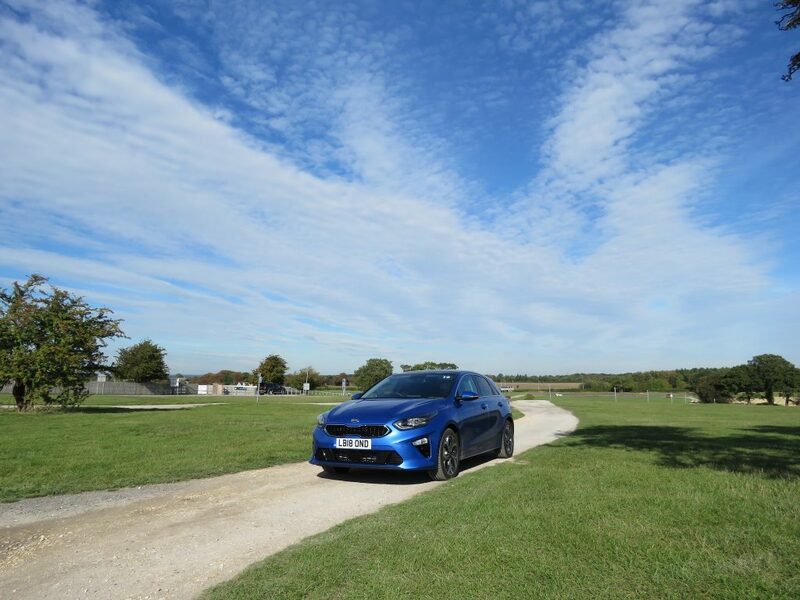 The new, fully-independent suspension system is capable of providing fun if you’re realistic about your expectations – this is a family hatchback after all. All-in-all the new Ceed is certainly taking Kia in the right direction. It looks and feels more upmarket than its predecessor and gains significant ground on the likes of the VW Golf and Skoda Octavia while remaining significantly cheaper and with more standard features. If you’re in the market for a mid-sized family hatchback and you refuse to join the SUV masses, then the new Ceed makes a lot of sense.